BADIMJAN TURSHUSU – Stuffed and Pickled Eggplants. The word “turshu” came into Azerbaijani language from the Persian word “torsh”, which means “sour”. Turshu usually served with a meal as one of appetizers, and some lunch or dinner meals can’t be completed without it. There are many varieties of turshu in Azerbaijani cuisine, such as garlic, cabbage, eggplants, bell peppers, green tomatoes and even fruit turshu. 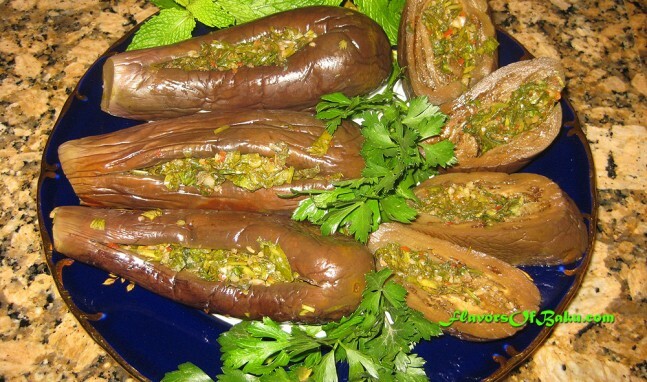 One of the popular type of turshu is Badimjan turshusu – Pickled and stuffed eggplants. Wash the eggplants and remove their stems, but do not peel them. Cut a long slit down the middle of each one while being careful not to cut too deep to the bottom. Sprinkle some salt inside of each eggplant and let it sit for an hour to get rid of the bitterness. Then, place them in a large pot with salted, boiling water, and blanch them for 10 minutes until they are tender, but not too soft. Afterward, move the blanched eggplants onto a large plate, place a heavy object on top of them (a plate or cutting board) to squeeze the moisture out. Let them sit for about two hours. Wash the herbs, then pat them dry and finely chop them. Clean the garlic cloves and mince them. Remove the stems from the chili peppers and cut them in half. Deseed and mince the peppers (make sure you wash your hands well after mincing, you can burn your eyes if you rub them). In a large bowl, mix the herbs, garlic, and peppers with 2 tablespoons of vinegar and salt to taste. horizontally so they do not open up. Mix a cup of vinegar with a cup of room temperature water and add 2 teaspoons of salt. There should be enough marinade to cover the eggplants in a container. Pour the marinade into the container with the eggplants until they fully covered. Seal the container tightly with a lid so no air can enter, and set it aside at room temperature for 2-3 days. Then refrigerate it. Serve with any of your favorite dishes.